Oldenburg was the first show for us to present the three new ’59 bursts together with the lefty. They got a lot of positive responses as many took the opportunity to test them. 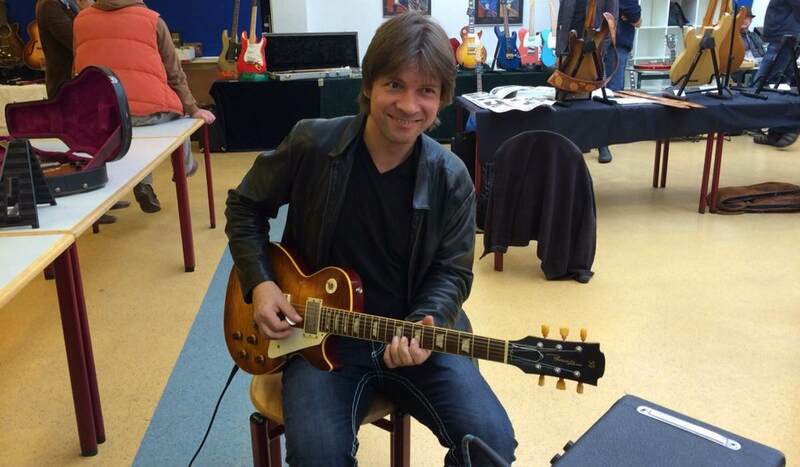 Gregor Hilden was there to buy some vintage guitars. But then he tried the ’59s and was impressed by the vintage ’59 sound. He bought one and said he may even keep it for himself. He also tried some Tribute Ts. The blond one with the Rutters / Panucci bridge went to Hilden. The butterscotch got his approval. And I am glad this one is still for sale here with us. Listen to the videos to hear him test the sounds. This entry was posted in Guitar talk, Music Fairs, Videos and tagged Gregor Hilden, Oldenburg vintage show. Bookmark the permalink.